Blade length should be ordered at the mid-point of manufacturer's recommendation to allow for take up. How does Friction bandsawing work? 1. Material is held to a fast moving welded to length saw blade typically running between 6,000-18,000 f.p.m. 2. 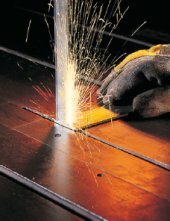 The high frictional heat created allows the band saw blade to burn or melt away the material while the bandsaw blade teeth remove the molten metal from the work piece.